As we ring in the new year, there are a few pest management considerations during the dormant and delayed-dormant period that should be on your radar. Cost-saving measures are always an important consideration, particularly in “lean” commodity price years. The basis of Integrated Pest Management (IPM) theory centers around economic concepts – treating pest populations only when doing nothing will cost you more than doing something, and treating at the most effective time using the best methods and materials available. 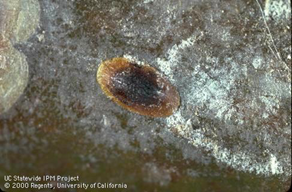 Scale pests – walnut scale, frosted scale, European fruit lecanium. Recent research has shown that there are two primary effective timing(s) for treating scale pests in walnuts: delayed-dormant and spring (crawler) timing. Knowing whether or not treatment is indicated begins with evaluating scale populations during the dormant period. This monitoring step should not be omitted as a cost-saving approach. Remember – the most expensive pest treatments are the ones that aren’t needed or don’t work. To monitor for scale pests during the dormant period, examine scaffolds, limbs, and branches for presence of pests and evidence of biological control activity. Make sure to look at recent prunings as well, or get up in the tree canopy on a pruning tower, as population densities or viability may differ at different heights of the tree. The decision tree (Figure 1) and photos below can be used to help you determine whether populations may require treatment. In the case of walnut scale, the scale cover can remain attached to the tree long after the insect beneath has died. 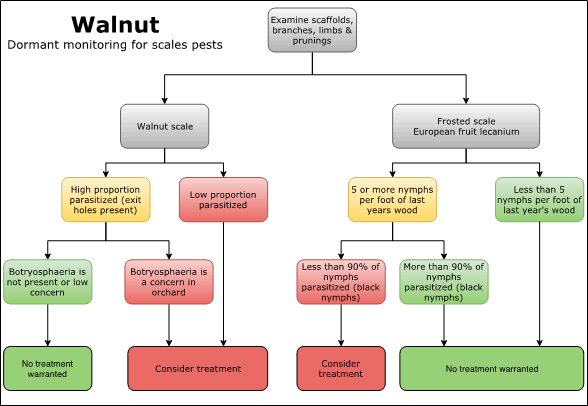 Take time to peel back the scale covers to evaluate the viability of walnut scale populations (live or dead, Photos 1 and 2), as research has indicated that properly-timed treatments using insect growth regulators (IGRs) can suppress populations for two to three years. Allowing more time between pesticide treatments saves money in application and pesticide costs AND allows the resident natural enemy populations to build up and provide FREE biological control. Figure 1. Dormant monitoring decision tree for scale pests in walnut (© EJ Symmes and DM Lightle 2018). Photo 3. 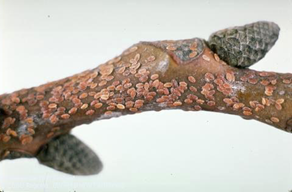 Parasitized walnut scale adult. Photo 4. Healthy (non-parasitized) frosted scale nymphs. Photo 5. Parasitized frosted scale nymph. Insect growth regulator materials (IGRs) are effective tools for managing scale pests if population evaluations indicate the need for treatment. These can be applied delayed-dormant (March), or when crawlers begin to emerge later in spring. Some considerations for each timing are bulleted below. Treat only if dormant monitoring indicates need. Often this will be a stand-alone treatment (only the insecticide in the tank for this pass through the orchard). Benefit to having the treatment completed before April/May, when other orchard activities ramp up, possibly limiting ability to precisely time crawler application. Follow up with spring crawler monitoring using double-sided sticky tape for walnut scale, visual observations of eggs/crawlers beneath frosted scale bodies. Time treatment to the emergence of crawlers (targeting peak crawler emergence; in our research trials, this has typically been approximately one week after detection of the first crawlers). Use the monitoring methods noted above. For walnut scale, look for the appearance of small, yellow, mite-sized crawlers to build up on the edges of sticky tapes. For frosted scale and European fruit lecanium, lift the adult female bodies and visually look for eggs (small, white, shiny in appearance; resemble tiny grains of rice) and crawlers (small, yellow, mite-sized; will be actively moving out from beneath the scale body). DO NOT time this treatment based on calendar (e.g., first week of May). Our monitoring over the past several years indicates that crawler emergence timing can be variable (we have observed onset of emergence as early as third week of April and as late as third week of May). Cost-saving benefit if coupled with another well-timed application (e.g., insecticide for another pest, fungicide, bactericide, nutrient) by saving a pass through the orchard. Navel orangeworm. In general, 2018 seems to have seen less harvest damage caused by navel orangeworm in California nut crops relative to 2017. Following the high damage year, nut crop growers throughout the state took more aggressive approaches to managing NOW, including more intensive sanitation efforts, increased adoption of mating disruption, and in some cases, additional in-season insecticide treatments. Growers who embraced this multi-tactic IPM strategy saw the best improvements to harvest damage. However, NOW remains a formidable pest with the potential to cause severe damage and losses in economic returns if growers do not remain vigilant. So, how do we approach NOW management keeping the bottom line in mind? Give yourself the best-case-scenario heading into the season by minimizing the resident population in your orchard and limiting NOW development resources during the season prior to husk split. Avoid over-reliance on late-season insecticide applications (the most effective of which are newer chemistries that are not inexpensive). Treating at husk split can take the edge off of the impacts of immigrant NOW populations. In general, however, research has shown that efficacy of husk split treatments is limited in walnut orchards due to coverage issues, and can be challenging when considering pre-harvest intervals. Yes, sanitation can be a relatively costly investment, but one that is worthwhile if you consider that this single activity can reduce your resident moth population to the tune of millions to tens of millions of resident moths by late summer. To get the best bang-for-the-buck with your sanitation efforts, evaluate mummy densities in trees, on the orchard floor (including berms and soil cracks), and areas in and around the orchard where nuts and debris accumulate. An additional step of cracking out some of the mummies to determine infestation rates can further indicate the areas of greatest sanitation need. In walnut orchards, there are often fewer mummies left behind in the tree canopies by mid- to late-winter (relative to almonds and pistachios), especially if we get some good wind and rain storms. This can save costs if shakers or polling crews are not needed to go back through the orchard to knock mummies down. That said, if your winter evaluation indicates significant mummies in the tree canopy, consider spot shaking or hand poling in those areas. If financial resources are a limiting factor for sanitation activities, begin in the areas of most concern (i.e., areas with most mummies, highest overwintering NOW infestation, blocks with historically high harvest damage). Blowing nuts off of berms into orchard middles prior to destroying them can provide added impact for your efforts. Flatheaded Borers. BOLO (be on the lookout!). In the northern San Joaquin Valley this year, unusually destructive flatheaded borer populations were observed (Photo 6). 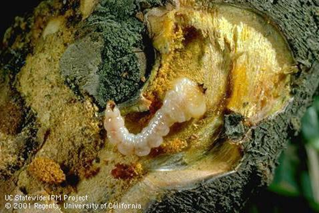 This is not a new pest in walnut production, and has typically been opportunistic in nature, selectively infesting diseased, damaged, or otherwise stressed trees (often young trees). The nature of the observations in 2018 indicated that the infestations were potentially more severe and not necessarily limited to young, damaged, or stressed trees. Modest information is available about flatheaded borers in walnut. An extension article by Jhalendra Rijal, UCCE Area IPM Advisor (Northern San Joaquin Valley), with additional information on the 2018 observations and photos is also available. UC research has been initiated to investigate this issue further. At this time, no additional treatments are indicated, and we are still working to determine the prevalence of this issue in other regions of the state. 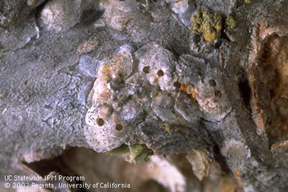 If you observe unusual flatheaded borer damage in your orchard in the Sacramento Valley, please contact Emily Symmes at ejsymmes AT ucanr.edu. Photo 6. Flatheaded borer larva.